We are just so excited to be back in the swing of things over here. For the past few months we were hard at work on the book and fell into a great groove of putting together projects in a much more focused and methodical way...always with the exact steps clear in our mind. So now that we've got the book done it feels great to still have that same methodical mindset in place but without any of the pressure. And we love that we were able to get this project out into the world pretty much as soon as we finished it. 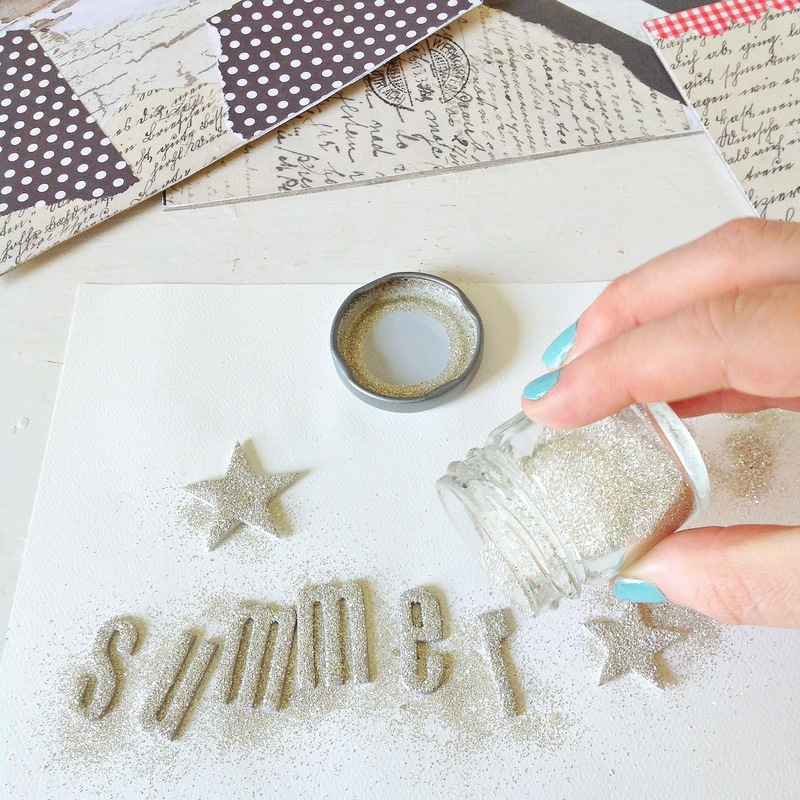 So, we hope you love our first craft tutorial of the summer! 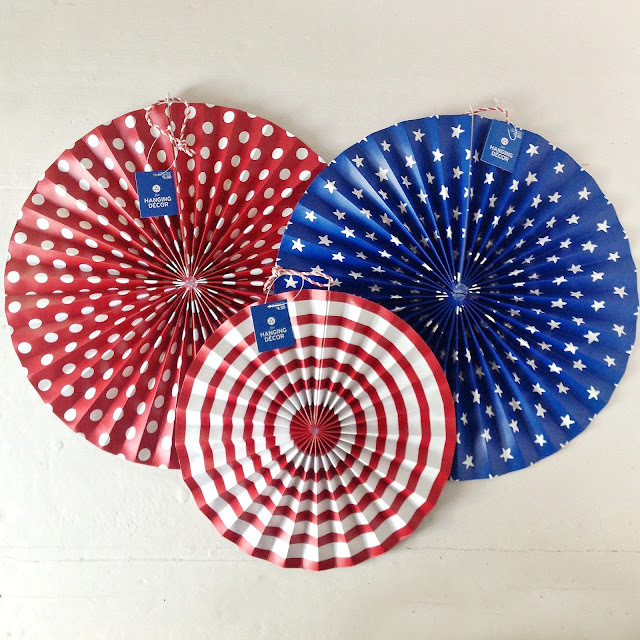 We popped into Target the other day and were loving all of the super fun 4th of July decor and party stuff...but out of everything, these paper fans were calling our name! We knew exactly what we wanted to do with them right away! They are made of a sturdy paper with a satiny finish, and if stored with care you should really be able to bring these out for many summers to come! This is a mixed media project but don't be scared if you aren't super duper crafty. It's all about gathering together some good stuff and assembling it in a creative way. 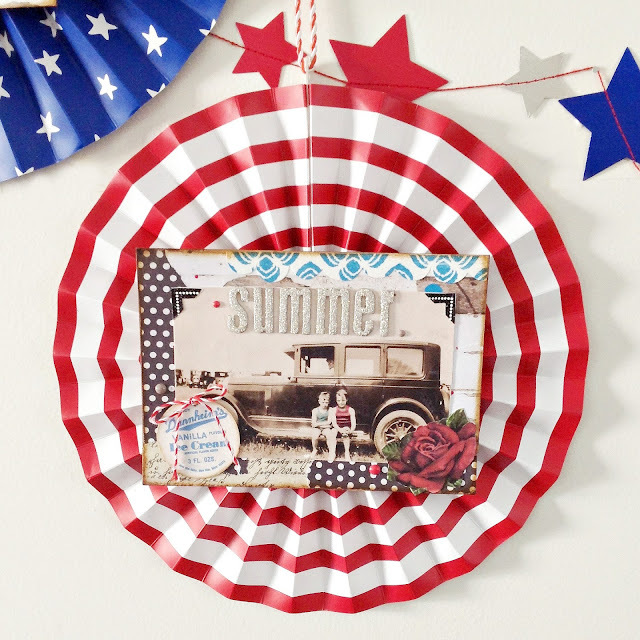 Really, if you have basic scrapbooking or crafting skills you can do these! First measure and cut your pieces of chipboard or mat board. These will be the bases of your collages. We made ours big enough so that there would be a good amount of space showing around our vintage photos. 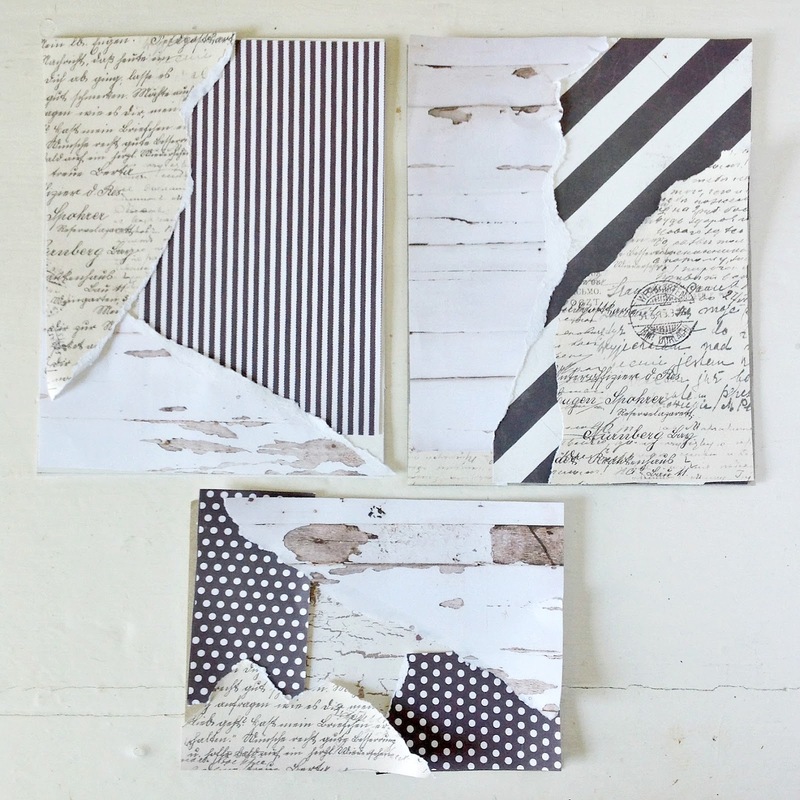 To start our collages we first went with a neutral, beachy, aged selection of papers...mostly white and cream with punches of black to ground the bright reds and blues. We ripped them and placed them on our boards so that they overlapped. 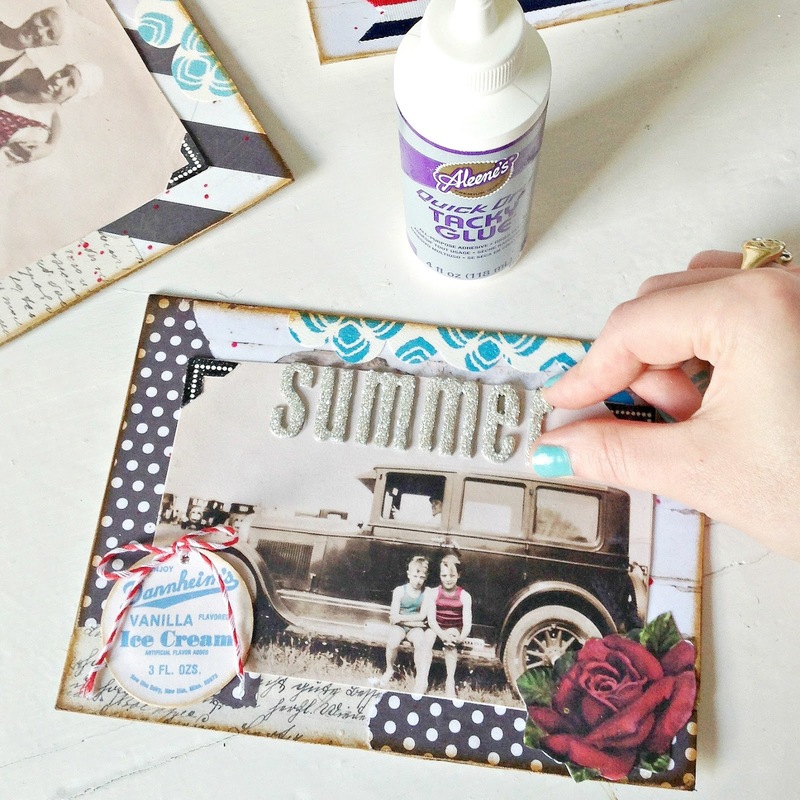 When you like the placement of your papers, then adhere them to your boards with a wide brush and mod podge. Wait a few minutes before sealing with a top coat. This helps to prevent bubbles. Put to the side to dry. Now, if you are a regular reader of our blog or are familiar with our work, you'll know that we work within a tight color palette. Cobalt or royal blue are not colors we normally dabble in. 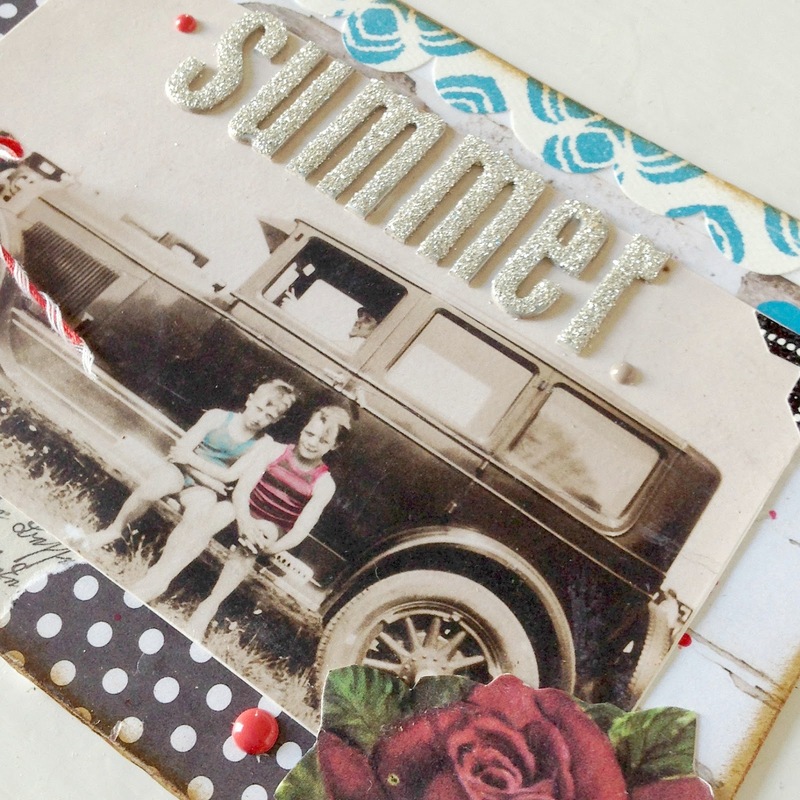 So even though we have hundreds of scrapbooking papers, we really couldn't find any blue hues that worked in this project. Perfect time to use our favorite sprays and stencils to create our own patterned papers! 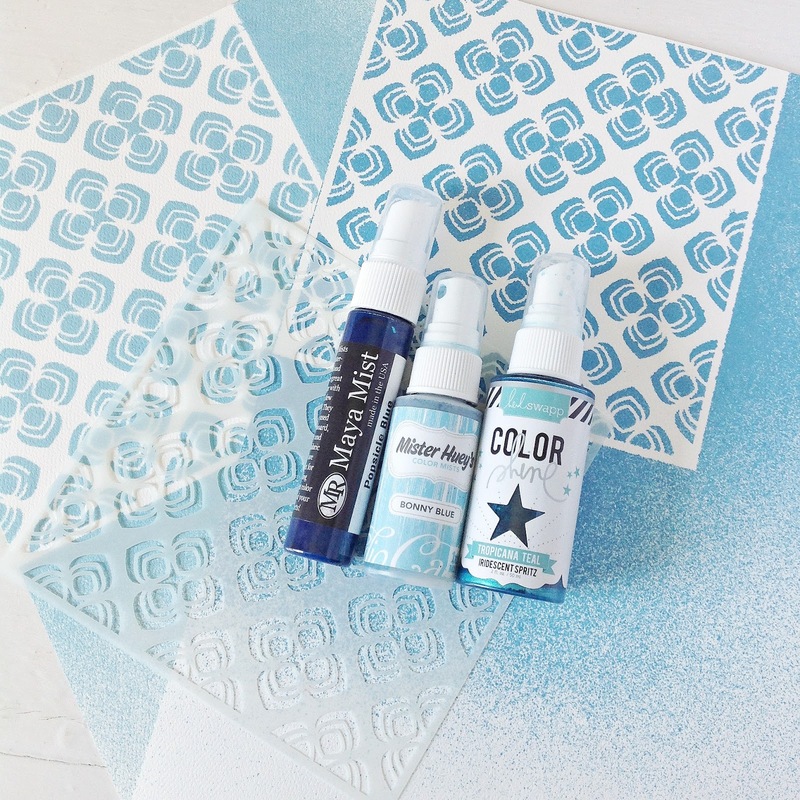 To do it, just grab a piece of watercolor paper, lay down a stencil, and use color mists to make patterned papers in hues you might not have on hand. We used these three mists to create the colors we needed. Then we cut a little scallop out of our homemade misted papers for two of the collages and used a red gingham for the third. We then placed them accordingly and adhered them with some mod podge and then sealed. 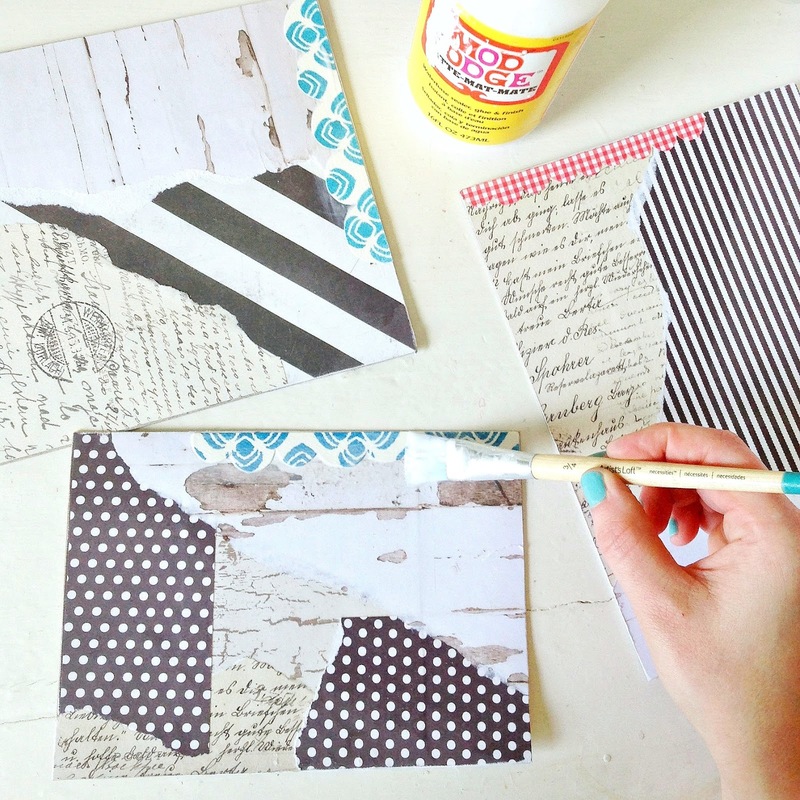 Once your collages are dry, add some speckling and dots of paint. 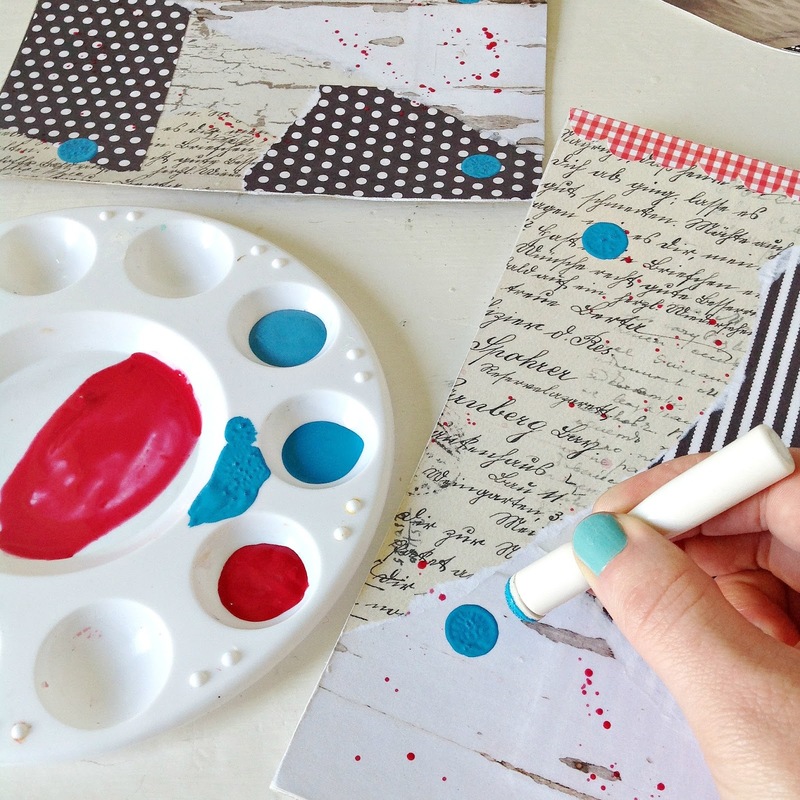 To speckle, mix one part water to one part paint to thin it out, then dip your round detail brush into the thinned paint, hold the loaded brush above the collage and tap the fore end of the brush so that the paint speckles the collage. And for the dots of paint these Martha Stewart daubers are great. We placed ours around each board so that when we lay down the photos later there will be bits of color peeking out. 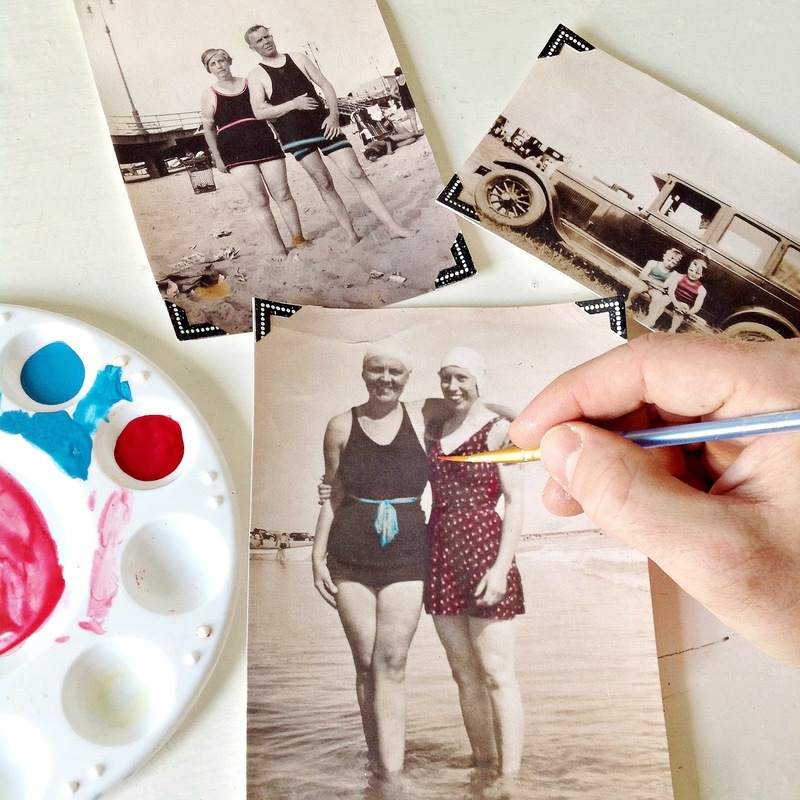 We almost always back our photocopied vintage photos with watercolor paper. It makes them super sturdy and holding them in your hand you'd swear they are originals! Even the creases in the photos show up in the copy. We also added some stamped 'photo corners' to add instant charm. Then with the same colors we had used for our speckling and paint dots we added some bits of color to our photos. Just use your round detail brush, a tiny bit of watered down paint, and brush color onto some areas. 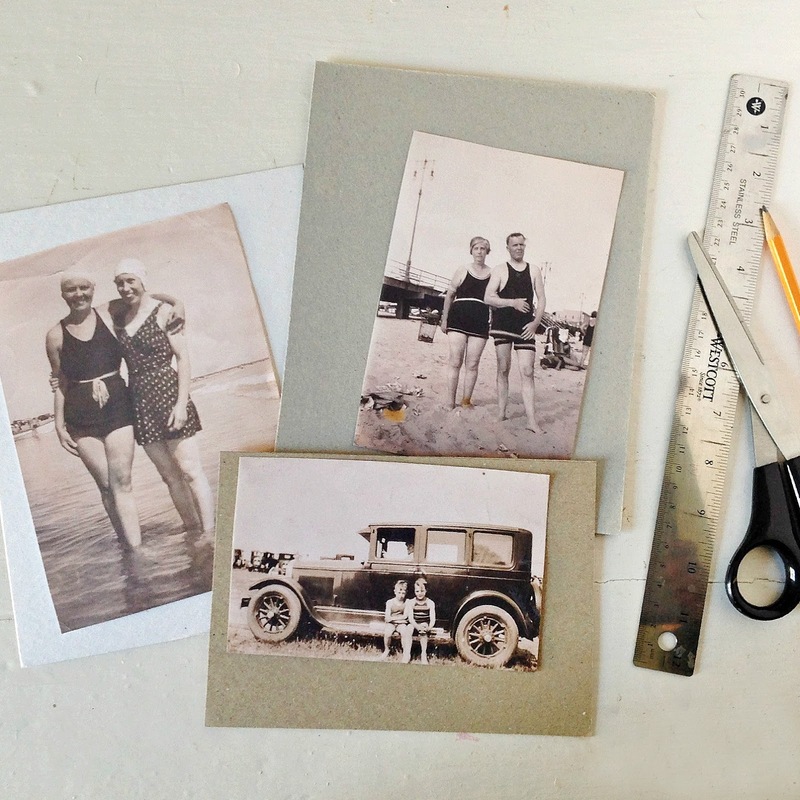 In tinting vintage photos, less is more. Don't go nuts with the paint. 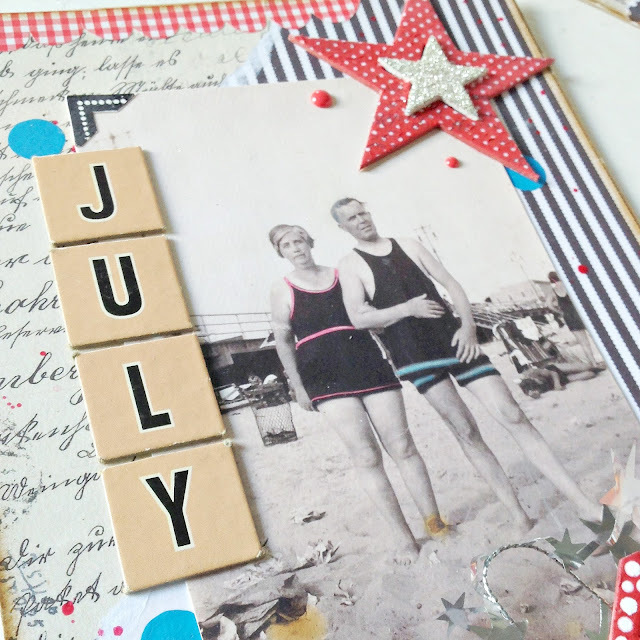 Maybe add a touch of color to the belts, or polka dots on a swimsuit? Accent all three photos and put to the side. Now, if you are anything like us, you love your Tim Holtz Distress Ink. Sure, you can use a paint wash...but with all of Tim's colors and the ease of application you just gotta go with Distress Inks. It is fool proof and in minutes your projects go from good to great! Instant age! We just stamped some "gathered twigs" onto the applicator and rubbed the edges of each collaged board to give them an antique glow. Now the fun stuff! The embellishments. We Used Aleene's Quick Dry Tacky Glue to adhere our embellishments. 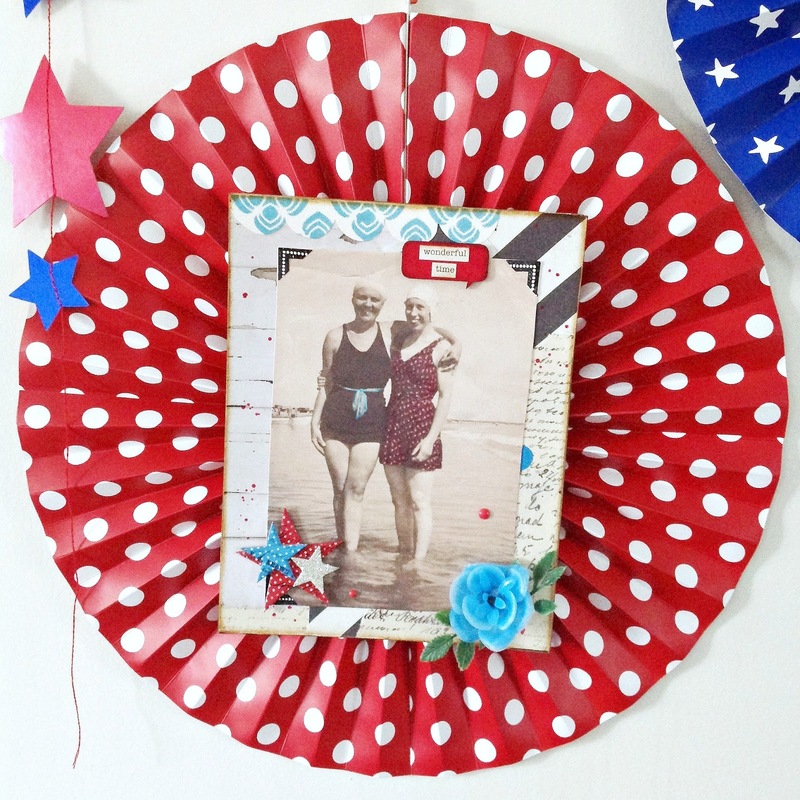 We added a vintage ice cream cup lid, and you can see that we applied just a touch of Distress Ink to the edge, then punched a hole and tied on some red & white bakers twine. Down in the corner a vintage rose die cut, and finally our glittery letters. Isn't it looking so fun?! Check out those boys! It looks as though they are pretty exhausted from a hard day of playing. We love these acrylic dots. 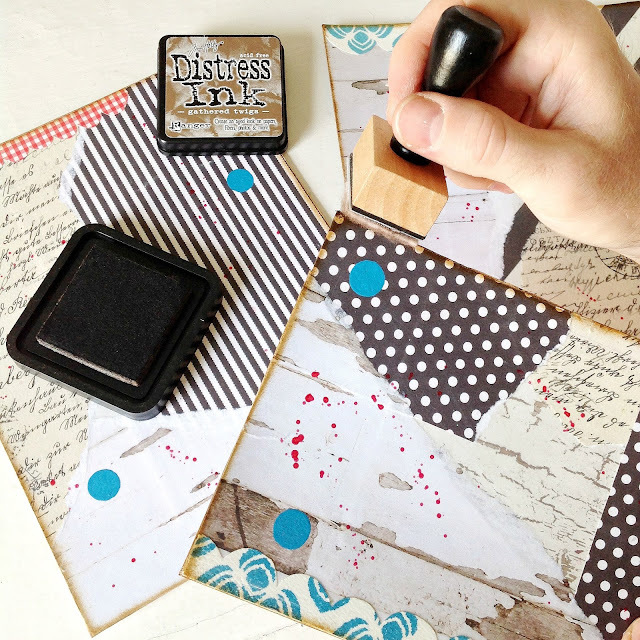 A few different Scrapbooking companies make them and they come in some super fun colors! They just work perfectly for adding pops of color with a bit of dimension. 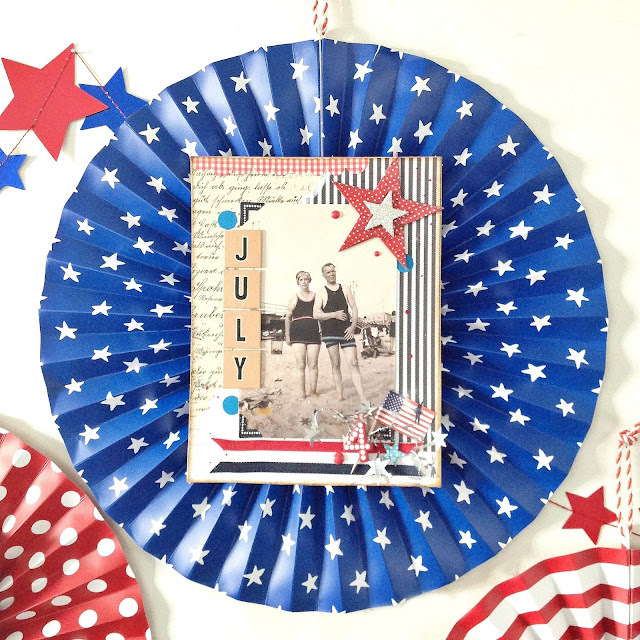 We also used some vintage board game letters to spell out JULY, some chipboard stars that we first misted, then a bit of red, white and blue ribbon. And down at the bottom we assembled a little cluster of stuff...a little flag cupcake pick, a chipboard number 4, and a bit of sparkly silver star garland. 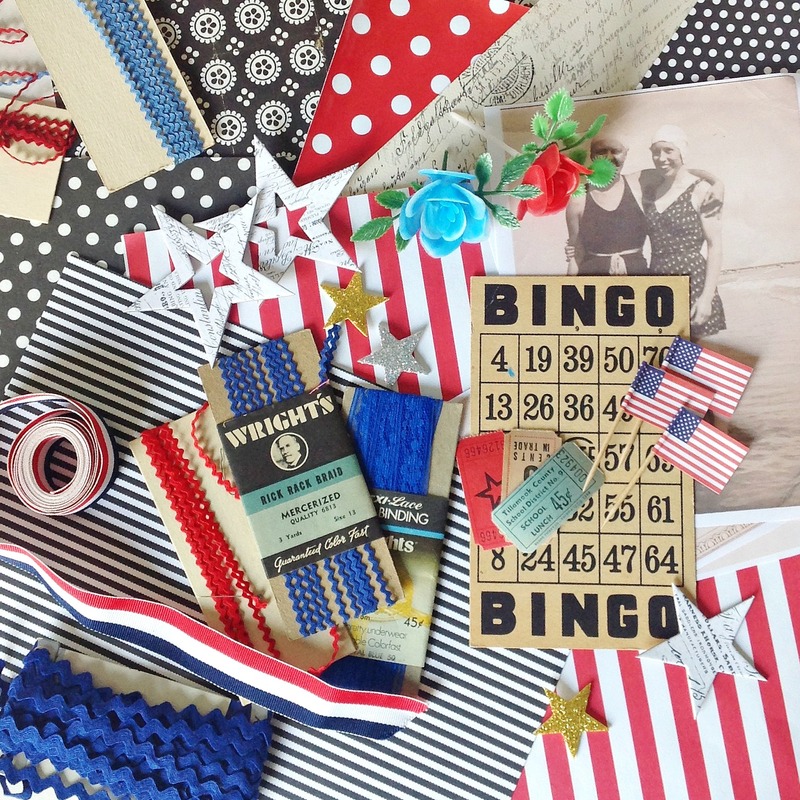 We love how all of these elements can work together to create the perfect little moment. Even though we do not know these folks (we found these photos at a flea market) we are giving them a history. Here we added a little wood veneer "talk bubble" and some text, a plastic rose cupcake topper (to adhere this we used a hot glue gun) and some more chipboard stars. 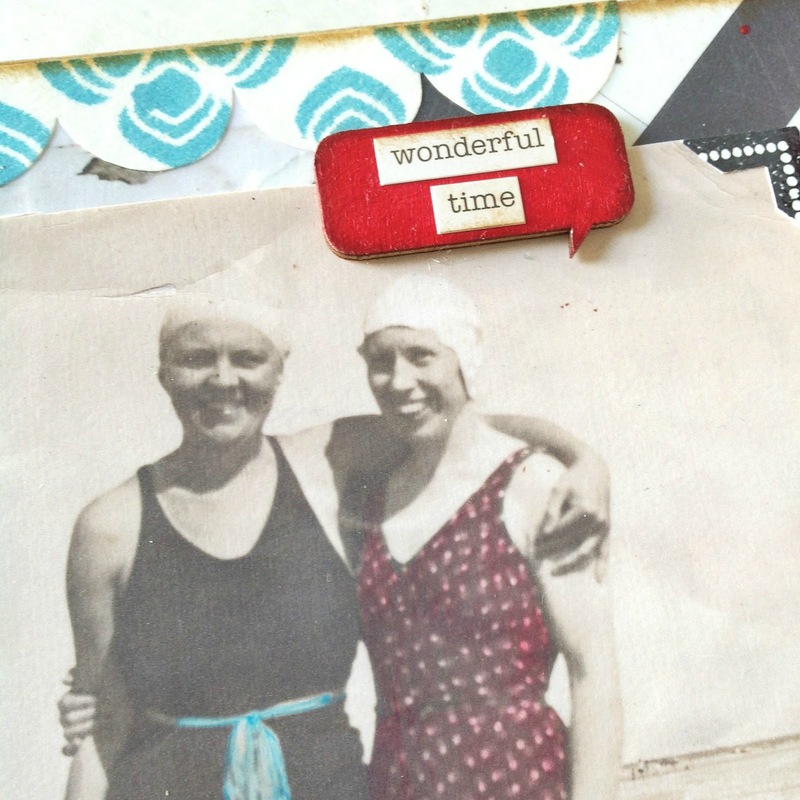 These gals look like they are having just that...a "wonderful time"
Now that your collages are complete all you need to do is hot glue them to the center of your paper fans! It doesn't take a ton of glue. 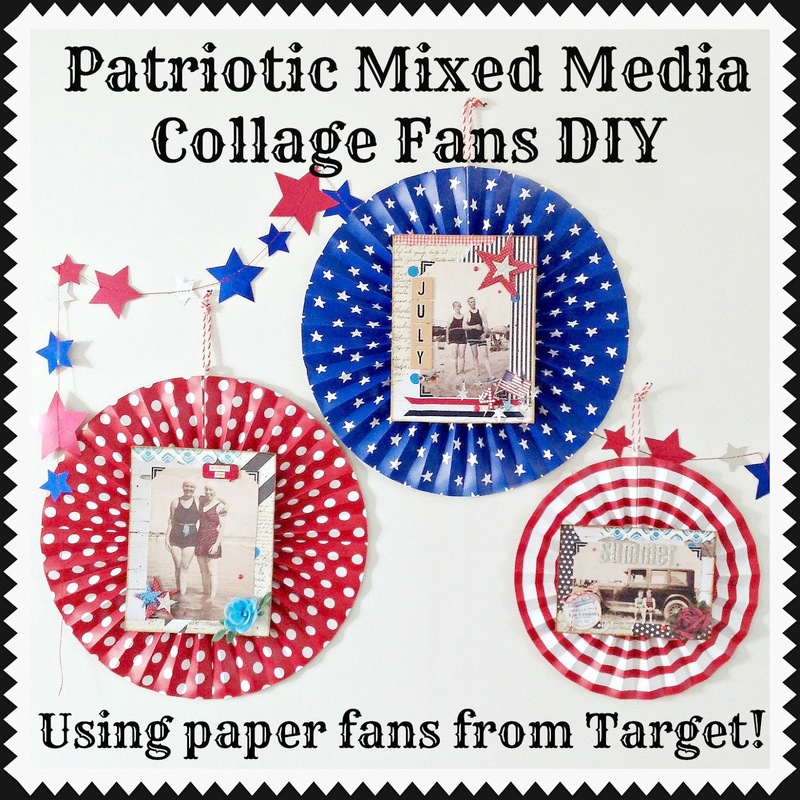 We did one big swirl in the center of the fan, pressed the collage on, and held for a minute. Ready to hang! Ready to Celebrate! We hope that you enjoyed this little project! If you did, we'd love it if you shared a link to it! Feel free to blog about them, or pin them on pinterest! We love hearing from you! If you have any questions about anything we used just leave a comment! Great project! thanks for sharing. I'm in the middle of a little patriotic project myself! happy sunday! Thanks so much Viv! Yes...it's good to get the jump on the red white and blue...it looks great all summer! These are AMAZING!! LOVING how you added the bit of color to the photos!! Thanks Julie! Yes, just a bit makes them pop. E, thanks! We're thrilled to inspire. And whats great about making photocopies and then sealing them first is that corrections are so easy to make. Hi JennyJenny! 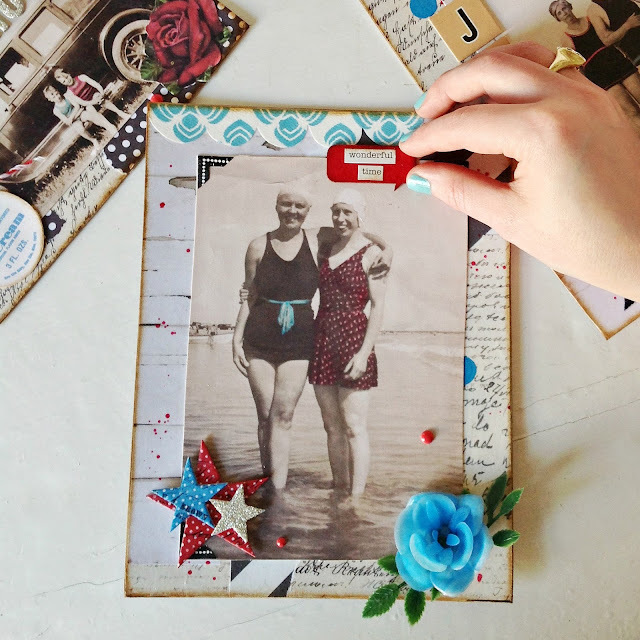 This is such a cute project! I just ran to Target and got my fans. 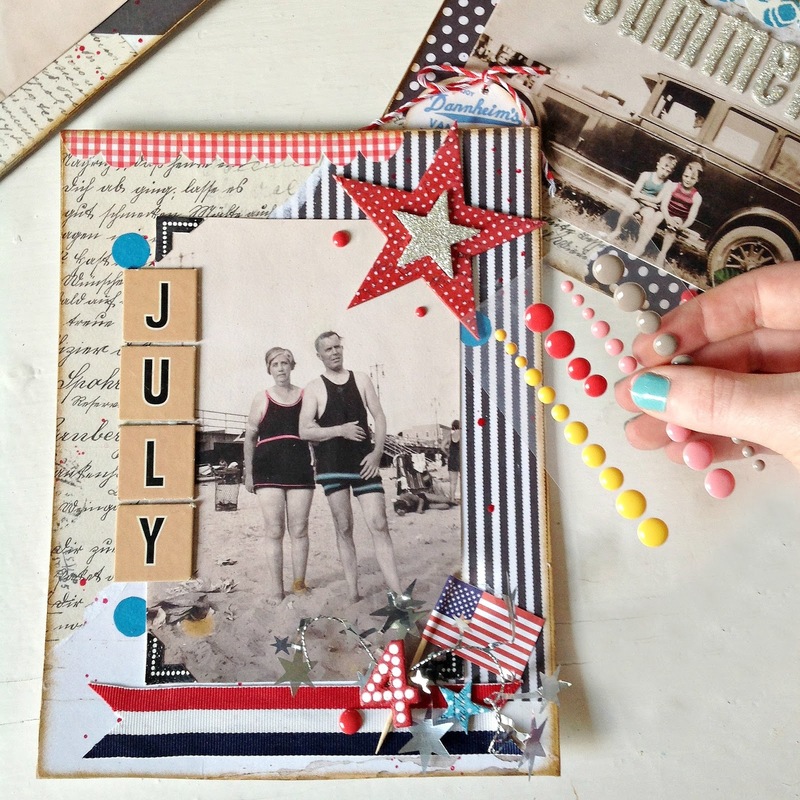 Can't wait to get making the collages!! Thanks so much for this fun idea! So exciting! Glad you were able to get some...we got lots of reports that they had sold out. Thanks so much for crafting along! Thanks so much Julia! Thrilled that you're spreading the fun around. We love this project!